I would like to mention a few points about these wild animals. They are just that – wild. They are not to be confused with domesticated “pets”. Each time you enter a cage with a wild animal you place yourself at some risk. And at times that could be life threatening as in the case with the big cats. But even the smaller ones can be very dangerous. Michael Bleyman almost lost his life after an ocelot attack, trainers who raised their animals from birth have been killed, and caretakers have had their arms torn off by big cats. You can never totally trust these animals. Here is a sample of a headline than ran in major papers across the country. The tiger was a generic animal, not a Bengal. I assume Bengal struck a chord with the reporter who didn’t know the difference. The incredibly stupid owner shot and killed the tiger. His son lived. I call this man ‘incredibly stupid’ because shortly before this horrific incident he visited Dr. Bleyman’s preserve. Michael told him under no circumstances should he walk the tiger on a chain, especially with his 3-year old around. The boy was simply prey in the tiger’s eye. At the time, Michael was trying to get state legislation passed prohibiting private ownership of dangerous exotic animals. Handlers interact with these animals because it benefits them. 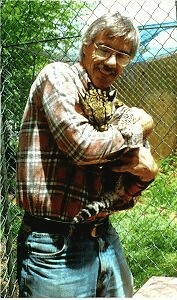 I discovered a tumor on the ocelot I’m holding in the photo because I was able to interact with him. Otherwise it might never have been found before it took his life. I do not recommend acquiring these exotic animals because you like the prestige, the novelty, or the possibility you might be able to make a living off of them in some way. They take expert care and are expensive to house and feed properly. I abhor roadside zoos that breed animals so they can shoot cuddly photos with paying visitors only to discard the animals after they become large and unmanageable. Visitors having a photo taken with a baby animal is one thing. Even they can be dangerous. But a photo with a large cat, like a tiger, sends the wrong message to anyone considering ownership of an exotic animal. You can never precisely tell when one of these animals will react in a potentially deadly manner. A perfect example is Roy’s (of Siegfried & Roy) attack in 2003. Did he know his animals? He thought he did. I would like to see private ownership banned. Baring that, I would like to see all owners USDA licensed. In addition, I would like to see owners and facilities exceed the minimum regulations set for the safe keeping and care of these exotic animals. No concrete floored, dreadfully small cages. Breeding should not be undertaken without expert, scientific guidance so degradation of that particular gene pool can be eliminated or minimized. If this all sounds Greek to you, then you should opt for a nice domestic.